One of the last rituals of the Buddhist year in Thailand is also one of the most unpopular: the draft. Every young Thai man must present himself for military service and, if he is not stupid or desperate enough to volunteer, can be drafted by lottery. He will then spend up to two years in the armed forces. Today—as red-shirt protesters stormed parliament and an embattled prime minister announced a state of emergency which grants even more power to an ascendant Thai military—I watched the draft take place at a school in Klong Toey, the dockside slum area in Bangkok. Hundreds of young men were given numbers, health checks, and a long wait in a sweltering hall for an uncertain future. The military needed to recruit 118 soldiers from this district. Only 57 volunteered, while three were dragooned for failing to register on previous years. The rest had to be drafted from 200 or so remaining candidates, who had a one in four chance of getting drafted. The lottery works like this. Each man must pull a ticket from a plastic bucket held aloft by an officer. If the ticket is black, he is free to go. But a red one assigns him to the army or navy. Families and friends crowded the windows and doorways. The air in the hall thickened. As each man nervously stepped forward, the crowd cried “Black! Black!” and cheered when a black ticket was plucked from the bucket. 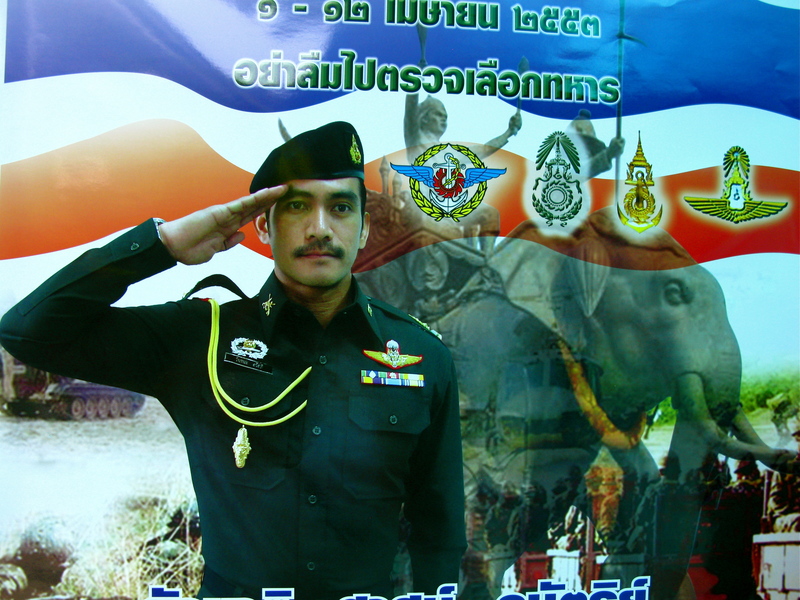 The army claims to be one of Thailand’s unifying institutions. Watching the draft, you realize how true that claim is. The army does bring Thais together, because absolutely nobody—red shirt or yellow shirt, Buddhist or Muslim, straight or gay—wants to join it. Those unlucky enough to chose red today might soon find themselves in Thailand’s three southernmost provinces, where a war against Malay-Muslim insurgents has claimed some 4,000 lives since 2004. (For more on this, don’t miss Orlando de Guzman’s brilliant new documentary, “Recruitment Day.”) Does this affect how many men volunteer? Not really, said Lt-Col Wiboon Sricharoensukying, the officer in charge. As educational standards improve, and as the economy recovers, fewer men choose to join, he explained. The prospect of deadly combat isn’t really a factor. Of course, with the freshly inked state of emergency now supposedly in force, now we’re all marching to the military’s tune. I asked Lt-Col Wiboon: Isn’t it true that soldiers really run the country these days? He replied slowly, as if reading from a script. “I still believe the army is the tool of the government,” he said. Then he began to laugh. Looking dapper in his beret there is Wanchana Sawatdee, a cavalry officer who’s either a captain or major. He plays the title character in the “Naresuan” series of historical-battle epic movies. Salute! Andrew I spent last Saturday with my wife and Thai son as he went through this process. We live in a Northern Bangkok suburb with several military bases in the district. So, maybe you would expect more “joy” when “deang” came up than “deum” but no. The loudest cheers were always for the black. As our son was towards the back of the line and there seemed to be a lot more black than red called, I was worried. I have been through a lot of the “Thai things” over the years, but never felt as nervous before. His mother was beside herself. However, when he put his hand in the jar, gave the paper bullet to the guy to read out and he shouted “Duem”, I did a “whahooo” that would made Homer Simpson proud and his mother nearly fainted. The last time I went through this was back in my home country when we had the draft for Vietnam. Thankfully I drew a blank. Others didn’t and it took them many years to restart thier lives again. And of many didn’t “restart” at all. As you say, this has been a tradition in Thailand for a long time, but in times like these the possible consequences are really brought home. BTW in our district their were more than 600 candidates and less then 200 places to fill. GeGee, My son is half-Swiss, which means he will have to serve in the Swiss army one day. Every Swiss man must: no lottery, no choice, almost no exceptions. And they have to keep going back, for weeks at a time, year after year. Still, I’d rather he served in the Swiss than the Thai army. The conditions are grim and the prospect of combat scares more men than that Lt-Col I spoke to would ever admit. The joyful scenes you described were repeated yesterday in Klong Toey. Mothers wept. Fathers leaped in joy. It is a dramatic and moving event to witness.